The warm, northward-flowing waters of the Kuroshio western boundary current leave the Japanese coast to flow eastward into the North Pacific as a free jet — the Kuroshio Extension. The Kuroshio Extension forms a vigorously meandering boundary between the warm subtropical and cold northern waters of the Pacific. A recirculation gyre exists to the south of the Kuroshio Extension. Another may exist to the north. This is also one of the most intense air-sea heat exchange regions on the globe, where the warm Kuroshio waters encounter the cold dry air masses coming from the Asian continent. The Kuroshio Extension system exhibits variations which strongly affect North American climate. Among the diverse fields that will benefit from this work are fisheries and climate research, and understanding storm tracks. 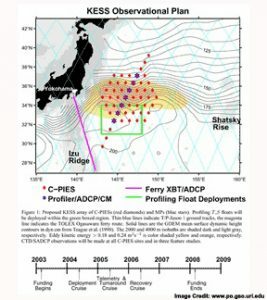 Understanding the processes that govern the variability of and the interaction between the Kuroshio Extension and the recirculation gyre is the goal of this study. Processes coupling the baroclinic and barotropic circulations will be examined by case studies of the local dynamical balances, particularly during strong meandering events. The mechanisms by which water masses are exchanged and modified as they cross the front will be characterized. The objective is to determine the processes governing the strength and structure of the recirculation gyres in relation to the meandering jet. KEO mooring carries a suite of meteorological sensors to measure winds, air temperature, relative humidity, rainfall, and solar and longwave radiation. 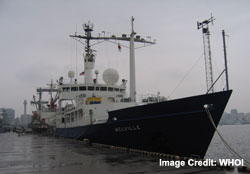 KESS cruises included data from a hull-mounted Acoustic Doppler Current Profiler (SADCP), which measured the velocity of the upper-ocean currents below the ship.